You need a vacation. And guess what! You can take one. Even if you work for yourself. Especially if you work for yourself. When you’re pouring every spare moment into building your business, pitching for new clients, getting work, and (yay!) juggling a full load of writing assignments, it can seem like it’s impossible to take a day off, let alone press pause and take an actual vacation. You’ve got goals! You’ve got deadlines! You can’t just… not turn your stuff in. Not if you want to keep your clients, anyway. But keep this in mind: the greatest asset you have as a freelance writer is you. Time away from work is a critical element of good mental health. If you don’t go “off duty” enough, you risk overworking yourself, stifling your creativity, and burning out. Still not convinced that you need a break? Think about it this way. 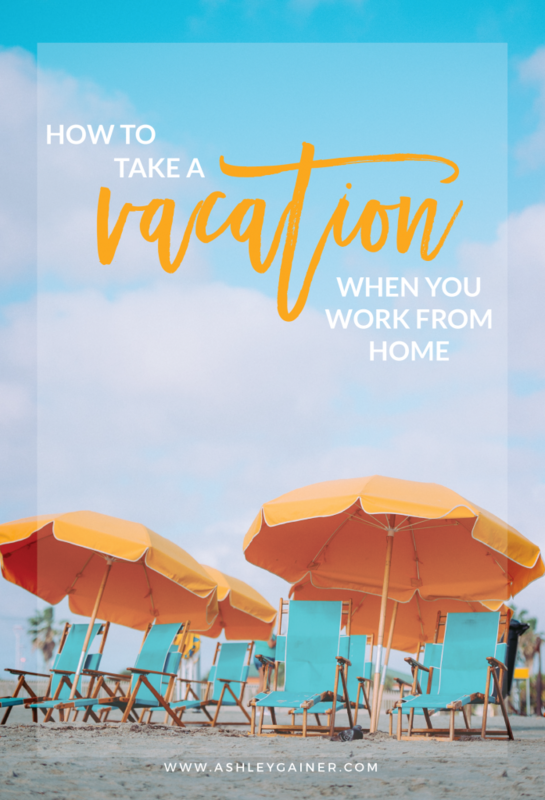 If you work for an agency or other corporation, you’ve likely got vacation time built into your benefits package. That means it’s expected that you take some time off at least once a year. 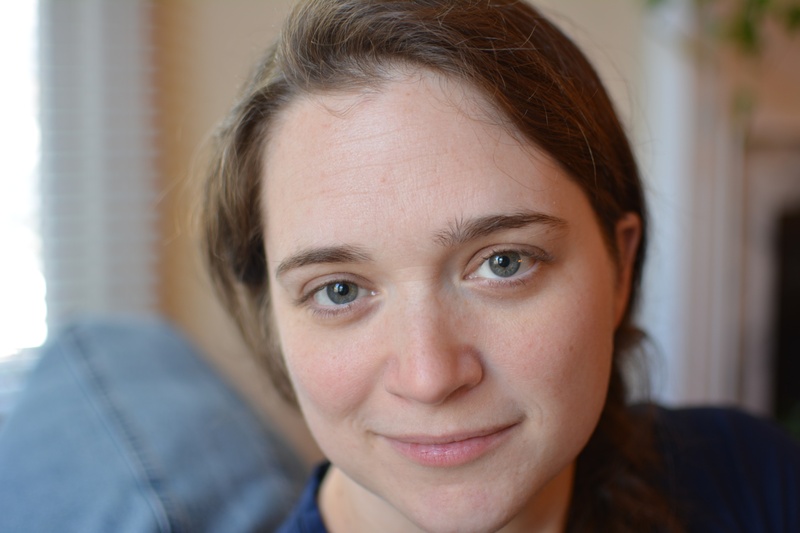 It needs to be the same for you now, as a work-at-home mom. It doesn’t always feel like this when you’re a freelancer, but the truth is that you are the boss. And when you’re the boss, you get to decide how much vacation you can take, and when to take it. 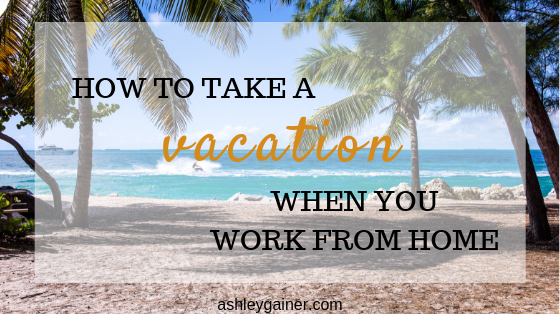 You could totally do a working vacation as a freelancer…but should you? Working vacations can be a great thing. You arrange your workload to lighten up those days as much as possible, and then you do a few assignments while you’re “on location.” I’ve taken many vacations like this. Hauling your laptop along on the family vacation is a great solution for a lot of work-at-home mamas. You can keep up with business, have a refreshing change of scenery (and pace), and still have time to make plenty of special memories for the family. 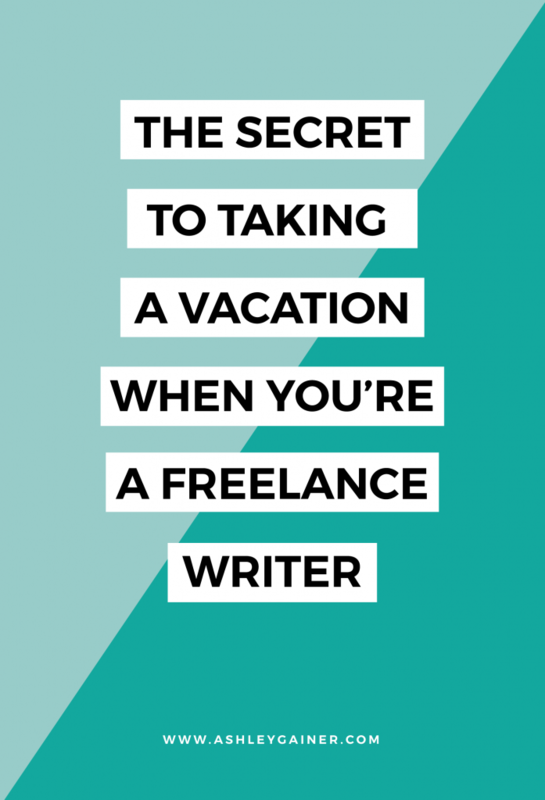 Plus, it feels pretty awesome to get paid on vacation… especially if it’s your writing gig that makes the vacation possible. But here’s the deal. You started working from home so that you would have more time for yourself and your family, right? So what’s the point of going through all of this building-a-business stuff if you don’t fully take advantage of the single most awesome thing it provides you? Just take a break already. Give yourself permission to take a few vacation days. Unplug and go be with your family. Your kids are only kids for a short time, and their memories of you need to include you, there, present. You could just be planning a “staycation” without going anywhere, but if you’re able to get away from work and focus on being “just Mommy” for a while, you’re still making memories that will last a lifetime. You can get away. Even if you’re slammed. Even if you feel like it’s pressure-pressure-pressure. Even if you have a steady flow of work. It’s really possible, I promise. All you need is some planning. When you’ve got a vacation on the books, schedule your deadlines around the vacation. Plan to turn things in the week before or the week after your trip. When you can hand that writing draft to your editor or submit those articles and move into “waiting for feedback” mode right before taking some time off, you’ll be in a great position to take the mental break that you really need. If you’re going to be out of pocket for a few days, let your recurring clients know at least a couple of weeks in advance. (I try to let them know about a month in advance.) This is a major courtesy to them, and they’ll appreciate the heads up — especially if you do work for them weekly or even more frequently. You never know what their internal calendars are dictating, and by extension, when they’d need to be in closer contact with you. You don’t need to tell your clients you’re going on vacation — unless you have that kind of rapport. All they need to know is that you’ll be unavailable from X date to X date, and that you’ll be happy to pick up a little bit of extra work before and/or after the break to compensate. The more notice you can give, the more you equip them to handle your absence… and the less likely it’ll be that you’ll have a bunch of fires to put out when you get back. It’s also helpful to send a reminder of your out-of-pocket dates when you submit your last assignment to each client pre-vacation. Remember Parkinson’s Law – the one that says that work will expand to fill the time you allot it? Uh-huh. If you don’t want to be running around like a maniac closing up shop on Friday before your 6am flight Saturday, then act like Thursday is your last day. Allow no Friday deadlines. As far as deadlines are concerned, that’s a black-out date. I personally would still be willing to schedule calls with existing clients that day, but I probably wouldn’t do any new-client calls. I’d just plan to be at my desk during my regular work hours (whatever they are) doing everything that needed to be done to wrap up… and maybe get ahead on something I’ve been neglecting, just for the feel-goods. Or, you know, last-second laundry and packing and cleaning out the fridge. My point is, having some breathing space to wrap things up nicely, get everything in order, and handle any last-second issues will send you off in great shape to come back effectively. And speaking of coming back effectively, do the same black-out thing for the first working day after your return. When you’re looking at the calendar the week of your return, give yourself at least a full day of “re-entry” before jumping right back into productive work mode. 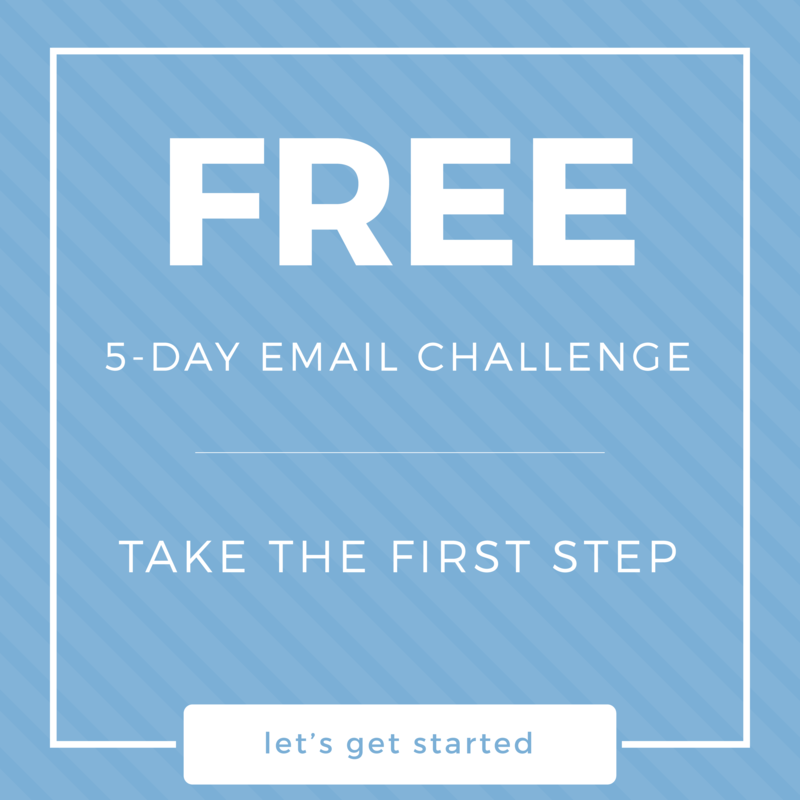 Schedule meetings, calls, or follow-ups, and plan to do some basic self-editing or brainstorming on that first day back if you want, but no deadlines. You may want to just plan for a “review and edit day” on your first day or two back, instead of making yourself crank all the way up to 10 immediately. Future-you will thank current-you for setting things up so it’s not a madhouse of pressure your first day back, and you’ll be able to enjoy your time away without any looming deadlines or work-related dread. That’s the kind of vacation you want to have! If you can, plan something fun to jump into on your first day back after a vacation. Maybe it’s a new course or book you’ve been looking forward to. Maybe you’re going to learn a new software or start working on a new website. What floats your boat? Having that thing to look forward to on your return will make it a little easier to click back into work mode after a much-needed break. Just don’t let any deadlines fall on that first day! This is one of my #1 survival tips for the work-at-home freelancing mama, and it’s especially valuable when you’re taking a break of any length. Whenever you step away from your desk, whether it’s for a week or a night, leave yourself notes, to-do lists, and the next steps to take. That way, you won’t lose too much time trying to get reacquainted and figuring out what was going on and what you were in the middle of doing when you left. Trust me: Taking those 30 seconds as you’re wrapping up will save you tooonnnnnnnsssssss of time when you sit back down. Because it can be hard to get away, many of us never take a break. When you’re a work-at-home mom, though, being able to get away is probably high on the wish list. That’s why we go into business for ourselves in the first place — being able to call the shots that make our family life ideal! Unplugging and getting away for a vacation might seem intimidating, especially if you’ve got a full docket. But just a little bit of smart preparation will make it much more feasible for you to get away and come back in good shape. Freelancers shouldn’t be afraid to take a vacation, freedom and flexibility is one of the best perks of being a freelancer! As long as you prepare, it’ll be stress-free!